PHOTO COURTESY OF HEIDELBERG UNIVERSITY/DOUG SAMPSON Heidelberg post player Maddy Crawford works in the paint against John Carroll’s Kahrin Spear earlier this season at Seiberling Gymnasium. Jon Dawson said that even he is a little surprised at how well Maddy Crawford is playing at Heidelberg. The Willard High School coach always believed in Crawford. He coached her and knows how tough she is. He watched the standout player have two seasons interrupted by ACL tears and knee problems, only to come back and thrive. On top of that, Dawson believed the 5-foot-9 post player would play college ball and be successful. But Crawford has surpassed even her former coach’s expectations. The Heidelberg junior is leading the Ohio Athletic Conference in rebounding, averaging more than 11 per game. She has 192 on the season, 40 more than the next closest player. She’s also leading the league with 33 blocks, all while averaging 13 points a contest. But then again, her high school coach knows Crawford. And that means knowing anything is possible. “I’d never write her off,” he said. Crawford praised the work of the Willard coaching staff for preparing her for the college game. But she also said her high school injuries gave her an appreciation for the game, and a desire to succeed. It’s an attitude that her college coach, Morgan Harrigan, not only helps her, but her teammates as well. “Maddy just brings our consistency every single game, and every day in practice,” Harrigan said. “We know that she’s always gonna bring that work ethic and mentality and play hard. When asked how Crawford is able to get so many boards at her size, Harrigan attributed it to attitude. And that dates back to high school. “It was really interesting to coach her with her physical make up and what she’s able to do, but Maddy was always one to get in the middle and mix it up, always able to hold her own,” Dawson said. Crawford said what has raised her game in college is just getting more experience and confidence. And not only is Crawford having a strong season, but Heidelberg has made major strides as well. After winning just four games a season ago, Heidelberg is 8-9, 4-6 in a log-jammed OAC. Crawford said the team has meshed, also, because of a degree of familiarity. Harrigan has done a strong job of recruiting from this area. Crawford is now teammates with players she went against, such as Norwalk graduates Jada and Jasmine Thomas. 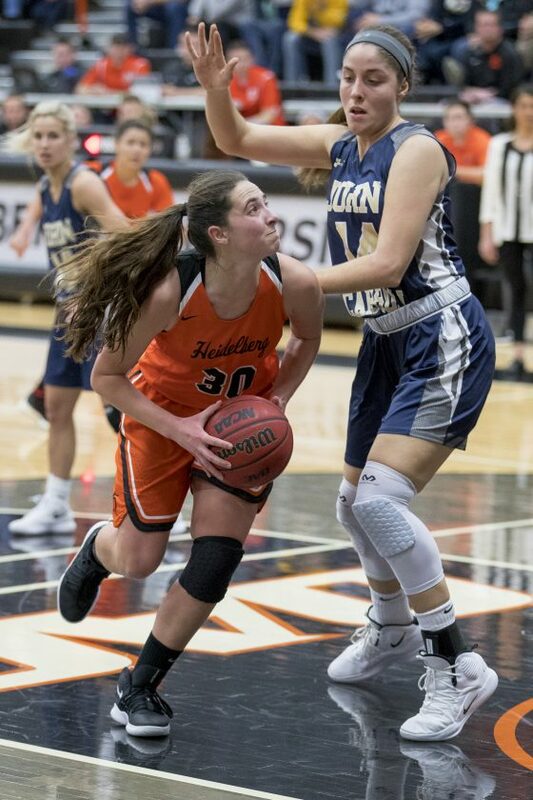 The Heidelberg roster also includes New Riegel’s Leah Bouillon, Old Fort’s Alli Adelsperger, Seneca East’s Kirsten Kochel, Carey’s Destiny Young and Fremont Ross’ Mattie Overmyer. Harrigan said players from this area just have a certain something. And Harrigan said a player like Crawford can not only impact the present, but the future of her program. But you have to be as tough and hard-working as Crawford.